The BenQ HT4050 is one of three new full HD 1080p resolution home theater projectors released by BenQ this fall. Priced at $1,399, it is the high end of the three, being a step up from both the HT2050 at $799, and the HT3050 at $999. While the HT3050 and HT2050 are built on the same basic platform with some noteworthy variations in features, the HT4050 is an entirely different model altogether. Not only does it look physically different, it has a more extensive feature set that includes frame interpolation, 2D to 3D conversion, and more lens flexibility. The BenQ HT4050 is intended to be the more elegant of the three new models, and it definitely is. The picture has a refined quality compared to its two lower priced siblings. The more expensive glass lens used in the HT4050 eliminates chromatic aberration. This contributes to a smoother, silkier, more film-like image than you get from either the HT2050 or HT3050. Having said that, we must also note that contrast (and consequently image depth) is somewhat better on two lower priced models. Casual observers examining them side by side would be more likely to notice the difference in contrast before they would see the difference in image smoothness, which is a characteristic that an experienced videophile would be more sensitive to. 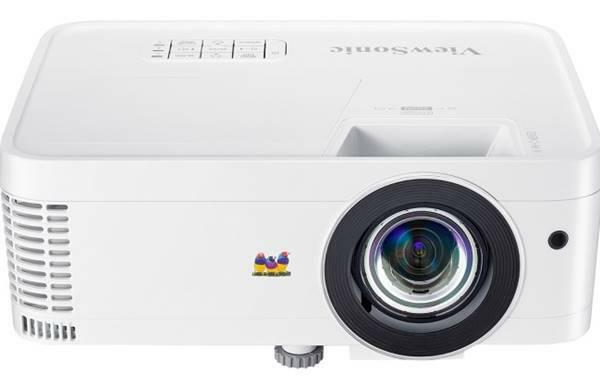 Many who buy this projector will be opting for Cinema mode, which is represented as calibrated to Rec 709, same as it is on the HT3050. However, the factory programmed Cinema mode color balance on the 4050 is closer to accurate Rec 709 than it is on our test sample of the HT3050. Moreover, the general tonal balance is superior, with colors looking more natural with low saturation elements looking precisely tuned and in balance with more vibrant higher saturation elements. This is a beautiful picture, perfectly watchable out of the box without any need for calibration. Vivid mode is incrementally brighter than Cinema and about the same as Game mode. This mode boosts color saturation and contrast somewhat but it is not overdone to the point that it looks fake. It is actually a very engaging picture. Color balance is still within the general ballpark of reasonable. As far as Vivid calibrations go, this one is extremely well done, and we would expect a lot of HT4050 users to opt for the Vivid setting for their normal movie viewing. Game mode is a bit brighter and slightly cooler in temperature than Cinema mode, but it is also serviceable for video/film. It activates the "Brilliant Color" feature, whereas the Cinema mode does not. Adding Brilliant Color to the image boosts brightness, and shifts color temperature. White objects appear brighter than they should, but the effect is not nearly as heavy-handed as we've seen on other Brilliant Color implementations. Much of the non-blue lower saturation colors are reduced in saturation somewhat. The picture is overall quite pleasant. Bright mode is the only one of the four that is way off in color temperature, producing a picture that is tinted an obvious green. This makes grass look brilliantly green, blue skies look cyan, while anything red or magenta becomes dull and brownish. We cannot think of a good use for Bright mode, but if you want a bright greenish picture, there it is. In general, the HT4050 delivers solid black levels and high dynamic range, consistent with what we've come to expect from DLP. The picture is sharp and clean with no excessive noise. Colors are (or can be) naturally saturated and well balanced due to high color brightness (see Performance section for details). The HT4050 has an impressive frame interpolation (FI) system which BenQ calls Motion Enhancer. You can activate it or not as you wish, but when set to Low it removes a substantial amount of panning judder without imparting any hint of undesirable digital video effect (or soap opera hyper-reality). At Medium and High, it virtually eliminates judder without introducing very much soap opera effect at all, which is quite remarkable. But in these modes it does introduce some intermittent ghosting artifacts that you may not be crazy about. Typically they occur when a subject in the foreground is moving sideways across the screen against a stationary background. This artifact is common in FI implementations, so it is nothing out of the ordinary on this one. Overall, the FI system works very well and is particularly noteworthy for its lack of soap opera effect. Rainbow artifacts are infrequent on the HT4050. Although the HT4050 has the same RGBRGB 6x speed wheel as its two lower priced siblings, rainbows do pop up a bit more than they do on the HT3050 and HT2050 (possibly due to some Pixelworks processing that exists only on the HT4050). When they do occur they are smaller and dimmer than typical rainbows on competing units. Overall, we would guess very few users would find the level of rainbow activity to be problematic. As with the HT3050 and HT2050, brightness uniformity is not terrific, measuring 75%, with the image tending to be less bright toward the upper left and brightest in the lower center. However, we see no obvious vignetting on this unit, and the relatively average uniformity is not visible in normal movie or video viewing. What picture mode was input lag measured from. I see the projector has a "game" mode. I'd be interested if lag is different in this mode with all extra processing turned off (FI, pixel enhancement, etc...). Usually, game mode limits extra processing and improves lag times. Please contact BenQ Tech Support for information on how to get your projector upgraded to the latest firmware. Is this projector able to be used with a curved screen? So the Frame Interpolation is not able to give the same effect as using SVP (Smooth Video Project) software in my HTPC? I want it to look more like Hobbit 48fps but also need it to be able to do this for 3D not only 2D as for 2D I can already do it with my HTPC. This will be a main factor for me. BTW ..."without imparting any hint of undesirable digital video effect (or soap opera hyper-reality" undesirable to you. Others prefer things to be smooth like real life not a slideshot fest like current 24fps movies but to each its own. Hey Mate is there one for the 1070 as It lags a fair bit when I online game. Any word on how much the new firmware version reduces lag time? How does one upgrade the firmware on the projector (do you need to send it to them?) Thanks. Trying to decide between the 3050 and 4050. The motion and pixel enhancers of the 4050 have me leaning that way. Will HT4050 support 1080p@60Hz input and convert it to 1080p@120Hz output whth Motion ehancer enabled, or not? Erik, I had the same questions regarding the lag time improvement of the Benq HT4050/W3000 with the firmware update. I am interested in that specific model mostly because of its longer throw compared to the otherwise exellent value-for-money HT2050/W1110. I don't find frame fnterpolation or image proccesing appealing for my purposes. Quite on the contrary, I am a firm believer that a good source material (as is a film in 1080p through HDMI) is always better with image proccessing turned off or set to minimum. Matters of opinion I know.. Anyway, I called Benq technical support (UK) and asked them to confirm that such update is indeed available. The guy I talked to was kind enough to inform me that such a firmware update does exist and it improves imput lag time among other things. According to him, the input lag was brought down to about 33-49 milliseconds if i remember correctly. Someone else could call them and double check if i remember the right figures and report back. Or even better, a proffesional reviewer could test it and put an end to all speculation. I also asked him if the update procedure could be made bu the end user and he replied that it is only possible if the unit is sent to Benq technical support. The reason he said, is that they don't want to risk people damagint their units in the proccess. He also told me that the latest firmware update was released somewhere during April and it has the firmware number 0.23.